Although many business people lump these two together as if they were one and the same, there has been quite a lot of work done by businesses and universities to untangle them and identify their distinctive qualities. If you expect management to produce leadership results you will be sadly disappointed. And the reverse is also true. Leadership and management have different goals and use different processes to achieve them. For example, management can be thought of as having the goal of coping with complexity (right side point), which is grounded in organizing and staffing (left side point), with the direction-setting element of planning and budgeting as the top point, and the activities of controlling variance and problem solving as the lower point. These elements are not the goal or the activities of leadership. Management can be thought of as a way to use hierarchies to produce efficiencies (doing things right). Want better management? Then work on these four elements. Leadership is quite different from management – starting with the goal being to produce useful changes. This is done by using networks to produce effectiveness (doing the right thing). A person is assigned or designated to be a manager. Whereas a leader can be anywhere in an organization, not necessarily the head of some activity, or the “boss” of other people. Leaders can emerge from anywhere, sometimes for only a specific issue, and other times as the “go to” person in the organization for a number of issues. 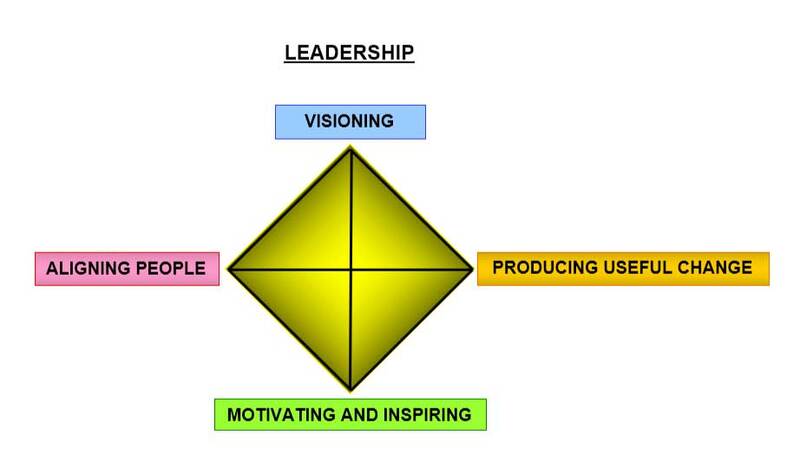 Leadership can be thought of as having the goal of producing useful change (right side point), which is grounded in the alignment of people (left side point), with the direction-setting element of visioning as the top point, and the activities of motivating and inspiring as the lower point. These elements are not the goal or the activities of management. Want better leadership? Then work on these four elements. There is also the issue of having the right person/team at the right time in the life-cycle of the organization. There are three types that may occur: the creators, the maintainers, and the destroyers. If they are in power at the time when the organization needs their particular sets of competencies, then the organization will prosper through its life-cycle. But if they appear at a time when the organization needs a different set of competencies (for example, creation has occurred, now there is a need for maintainers – but the destroyers show up), the organization will never reach its full potential. Recognize all three as being essential – but only at the right time. If you want to learn how to use the management and leadership models to improve both in your organization, call (941) 685-9622, for an introduction to the processes that can be implemented in your organization.